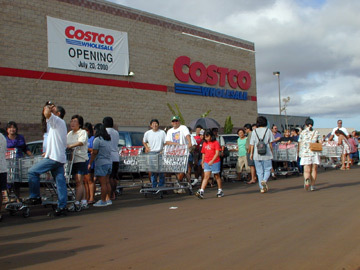 This was the scene in July, 2000 when Costco opened its new store in Waipio. The occasion had folks standing in a line around the building waiting for the store to open. Costco Wholesale Corp. is in the midst of an expansion phase in the islands. A brand-new Costco warehouse is set to open on Kauai in mid-October, delayed, but undeterred by higher than expected construction costs. An expansion of the existing Hawaii Kai store in East Oahu is scheduled to finish sometime before Thanksgiving. Issaquah, Wash.-based Costco also has a contract to purchase a 17-acre site in Kapolei from the real estate arm of the Campbell Estate, where it expects to open a new warehouse and discount gas station in the spring of 2008. "We've been very successful in Hawaii, and we're well accepted by all the islands where we do business," said Costco President and CEO Jim Sinegal. "I think probably it's an indication that what we've done is what we said we were going to do relative to delivering value to the consumers." The membership store on Kauai is to be Costco's sixth, in addition to three on Oahu, one on Maui and one on the Big Island. Sinegal declined to give precise rankings of the Hawaii stores nationwide, but said that the Iwilei Costco location is among the top 10. "Our Iwilei location is one of the top units we have in the company," he said. The standard store measures about 150,000 square and ideally requires a site of 15 acres or more, according to Costco's local broker, Steve Sofos of Sofos Realty. Costco's real estate team typically conducts a detailed analysis of potential sites, he said, which include criteria such as how products and gas would be delivered. Sofos said Costco has generally been welcomed in communities here, even though expansion and construction of new stores can take years. "People like Costco so much, we get calls all the time -- would you like to come over here?" said Sofos. Nevertheless, the expansion of the warehouse at Hawaii Kai Towne Centre took up to six years to negotiate with landowner Kamehameha Schools. Costco acquired the site for the Kauai store, a 14.76-acre parcel in Puhi, from Grove Farm Land Corp. last year. The store was originally scheduled to open in August, but was delayed due to higher-than-expected construction costs. The new target is Oct. 17. Meanwhile, Costco is searching for new locations -- Hilo is one possibility -- though there are no firm plans at this time. "We've scouted sites out there," said Sofos. "But no decisions have been made, and we're still looking." Unlike Wal-Mart Stores Inc., Costco seems to have provoked little controversy from its plans for Kapolei. The difference came down primarily to real estate, according to Maeda Timson, chair of the Makakilo/Kapolei/ Honokai Hale neighborhood board, which voted in August in support of Costco's project. Wal-Mart chose the "worst place a large box store could be," said Timson, given the traffic problems that already exist at that intersection. "Costco is at the entrance of an industrial park, away from homes," she said. "The board was also really pleased with all the information that was given ... it was a pretty comprehensive plan of what they were going to do." Worldwide, Costco operates 487 warehouses, including 358 in the United States and Puerto Rico, 68 in Canada, 29 in Mexico,18 in the United Kingdom, five in Korea, five in Japan and four in Taiwan. The first Costco opened in Hawaii in 1988 at Bougainville Center, in a 131,000-square-foot warehouse now up for lease by the MacNaughton Group. The Company plans to open an additional 20 to 21 new warehouses in the first four months of fiscal 2007, prior to the end of calendar year 2006.